Supporters of Bernie Sanders have long known about Jill Stein's offer to surrender her spot on the Green ticket to him if he would be willing to defect from the Democratic Party. Sanders has never shown any interest in that offer--perhaps because he understands a point about sore loser laws that few Greens (apart from Texans such as myself) appreciate. Most people understand that the Green Party doesn't have ballot access in all fifty states. In 2012, Stein was on the ballot in 37 states (and an eligible write-in candidate in 7 more). So far in 2016, the Greens have secured ballot access for Stein in 24 states and are currently working to achieve it in 23 more. It's certain that she won't be on the ballot in Oklahoma, North Carolina, or Indiana. As of this writing, the Greens lack ballot access in 8 sparsely populated north-central states that, added together, carry the same weight in the electoral college as Texas' 38 votes: Utah (6), Idaho (4), Montana (3), North Dakota (3), South Dakota (3), Wyoming (3), Iowa (6), and Minnesota (10). By Novemeber, the Greens will probably be on the ballot in most of those states, since they jumped through the hoops to qualify in 5 of them in 2012 (Utah, Idaho, North Dakota, Iowa, and Minnesota). Missing out on ballot access anywhere in the country matters, of course, but for presidential candidates, it matters most in the states with the most votes in the electoral college. From any presidential candidate's perspective, it's simply more important to be on the ballot in Texas than in Wyoming. If Bernie were at the top of the Green ticket--Texans wouldn't be able to vote for him. That matters even though Texas is a reliably Republican state because ballot access in Texas will help the Greens break through one of the most difficult barriers in American presidential politics: the 5% of the popular vote necessary to receive federal funding. With Nina Turner as Stein's vice-presidential nominee, Texans will turn out in droves to support the Greens. 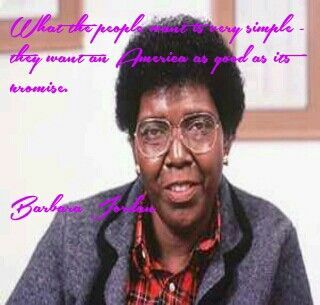 Turner loves to quote one of the great slogans of Texas' own Barbara Jordan, who spent her career calling for "an America as good as its promise." I live in Austin. Jordan is still legendary in these parts, and Turner strikes a powerful chord with Texans who were once inspired by figures such as Jordan (who is no longer with us) and Jim Hightower (who has been a vocal surrogate for Bernie). By running a Stein/Turner ticket, the Greens are sure to get tens of thousands (perhaps hundreds of thousands) of votes from Texans who simply wouldn't be allowed to vote for a Sanders/Stein ticket. Nominating Turner for VP is the smartest play the Greens can make for numerous reasons. I read earlier that Turner considers herself a reformer who intends to work within the Democratic Party, but I hope she will reconsider. Turner can help us all tremendously by recognizing the truth of Stein's assertion that it's hard to have a revolution within a counterrevolutionary party.